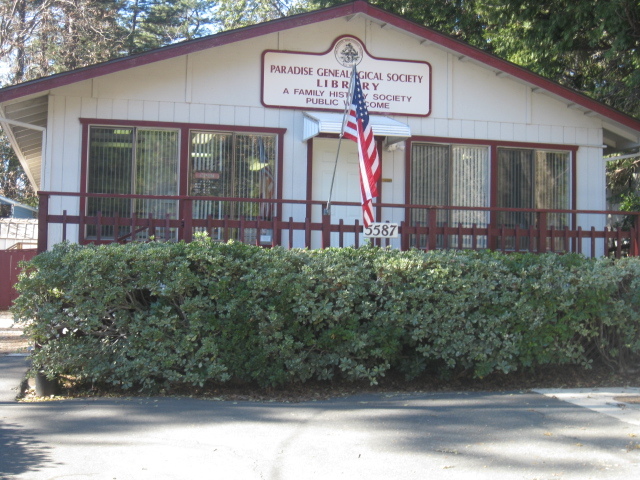 Due to the Camp Fire of November 8th the facilities of the Paradise Genealogical society have been substantially damaged and are not able to provide the help or the research to our patrons, friends, and visitors. A general meeting was held at the "Daughters of the Golden West- Annie Bidwell Parlor" yesterday, 1/17/2019. The Address is: 965 Salem St., Chico. We will be holding our meeting at the Parlor on the 3rt Thursday of the month until further notice. We thank the ladies of the Parlor for their generosity. An election of officers was held. Because of the confusion and disruption from the fire there were some positions that were not filled. The following positions were filled: President- Ed Wilhelm, 2nd- vice President- Gordon Taylor (membership), 1st Vice- President-vacant (speakers), Corresponding Secretary (vacant), Recording Secretary (vacant), Treasurer- Danielle Wanchek, Librarian- Carol Sutherland,4 directors at large are open. Content: Much of the Florence Styles collection has been discovered within the LDS microfilming process of the 1992 period . To reestablish our lost records will require extracting that information and re-posting to a usable style. There is a gap between 1992 to 2016 in the obituaries. That too would be a re-posting project. Alternate office/storage space: The search for space to work a small office and storage is ongoing. The need for a public library as we had before is questioned, at least for now. We have progress to report since our last general meeting. A temporary office has been found and a lease for one year has been signed. We expect to move in near the first of April. After that the real work of reestablishing PGS will begin. The temporary office is located in an old office of a farm building on their property. It is in south Chico and not inconvenient to most members. The address for mail will be the same as we now use but, for now there will be not telephone service, maybe later. We will have email contact, as we do now. No change there. I anticipate that our first order of business will be the purchase of a computer, scanner, and printer. After they are hooked up and working, we will be to acquire our backed-up materials. After that I would expect to see our volunteer librarians pick up on reproducing our basic research materials and lost unique items. 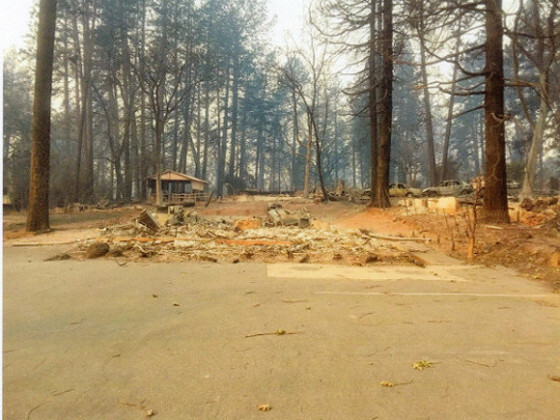 Our burnt over property in Paradise is waiting for the mandated cleanup to happen. This gives us some time to sort through some property “What to do abouts”. Septic system, water, new building, etc. Some big items yet. I am hoping that the next time I report we will be busy recovering out lost treasures and can see far enough into the future to talk about accepting genealogical inquiries. By the way, I have been informed that there are a lot of broken links on our Pargenso web site. I am hoping to resolve a lot of that by next time also. Thanks for the interest shown. We now have a new location from which to do our return to genealogy. It is located at 2683 Hegan Lane, Chico CA 95928. It is part of an outbuilding of one of the members. We have gotten a desk and the computer up and working. The librarian is busy getting everything into good order so that we may begin (toward the end of the month) to address the needs of recovery of materials and recapture of lost data. We need to do this in an orderly manner so we don’t become overwhelmed. I do not see the ability to do research for others until latter in the year or maybe next year. So that is still on hold. Meanwhile, our normal operations are picking up. The membership roster is coming back to life, the board is picking up additional directors, and the general meeting are starting to function at the normal routine manner. The annual fundraiser spaghetti dinner will this year be a “non-spaghetti fund raiser”. We do not have the resources to try the dinner this year. So instead, we are soliciting donations to our fund raiser instead. We would certainly appreciate having a donation made to the Paradise Genealogical Society, % Non-spaghetti fund raiser, At P.O. Box 460, Paradise, CA 95967. Any amount would be appreciated. Normally we would receive about $40.00 per person, so that would be nice. The membership has been very helpful and enthusiastic about support during this ordeal. We have several of the newer members volunteer for responsible positions and assist with the needed legwork. Thank you Members.